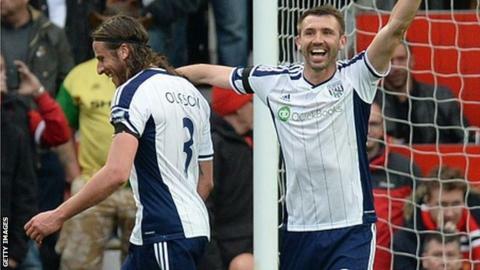 West Brom defenders Jonas Olsson and Gareth McAuley have signed new one-year contract extensions until 2017. Olsson, 33, has been with the Baggies since 2008 while McAuley, 36, has made 171 appearances for the club since joining in 2011. "It's great for both Jonas and I," said Northern Ireland international McAuley. "When you're settled somewhere and you enjoy it, and you enjoy the football and the people you work with, it's an easy decision to make." Both Olsson, who played for Sweden at Euro 2012, and McAuley were out of contract at the end of this season. Central defender McAuley, who joined from Ipswich, is hoping to represent Northern Ireland at Euro 2016 in France this summer. Olsson joined Albion from Dutch club NEC Nijmegen in 2008. West Brom are 14th in the Premier League table, on 40 points with six games remaining. They are at home to 15th-placed Watford on Saturday.